30 Day Style Challenge, Day 23: Wrap Star! I love when wardrobe pieces can be worn in many ways. While I am a certified clothes horse, getting mileage out of what I have in my closet is a must. When I received this Kiyonna top in my Gwynnie Bee delivery, I thought it was a just cardigan. It has ties, and it’s modeled on Kiyonna’s and Gwynnie Bee’s websites as being tied in the front. However, I noticed little holes in the side seams. At first, I thought maybe it came unsewn a little bit and I needed to fix it with a needle and thread. I then saw that the holes were reenforced, so I knew they were there on purpose for some reason. I decided the cardi was a keeper, bought it from GB, and didn’t give the tiny holes a second thought because they aren’t very noticeable. This morning, I was browsing Kiyonna’s website knowing they offer this cardigan in pink as well with the proceeds supporting the fight against breast cancer (more on that later). I happened to read the customer comments, and found out the little holes on the side were for stringing whichever front tie you’d like through, tie in the back, and *boom* wrap top! Mind blown. The fabric is really nice and super soft, too. We’re still getting temps near 90 degrees in my neck of the woods, and it’s light enough to be comfy on days when I want to be a little bit dressy. As the seasons change, I still feel like it’ll get a lot of wear. Aside from how you tie it, it looks great on its own, over a camisole, or under a blazer. Right now, since I’m job hunting, I’m really thinking about interview attire. Fingers crossed, I’ll get to wear this top for a job interview soon! I mentioned earlier that this top, called the Sunset Stroll Bellini, is also offered in pink on Kiyonna’s website. All October, they’re giving the proceeds from the sale of this top to a breast cancer charity. Also, if you use both of the hashtags #ShowYourPink and #KiyonnaGives on social media while posting a pic of yourself wearing something pink, they’ll donate $1. I am a Kiyonna affiliate and use redirected affiliate links, but this links directly to the Sunset Stroll Bellini in Pink, so click away for a good cause. I bought mine today, and I can’t wait to wear it! Also, check out fellow bloggers, Rebecca of The Plus Side of Me and Hailey of Discourse of a Divine Diva, who also have posted about this awesome separate and show even more ways to wear it! What are the most versatile pieces in your wardrobe? Let me know in the comments! Thanks for stopping by, and that’s a wrap! 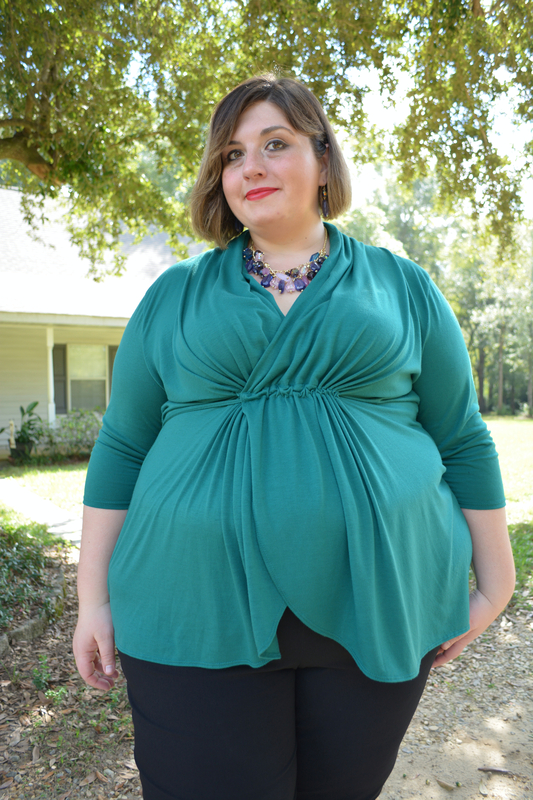 4 responses to 30 Day Style Challenge, Day 23: Wrap Star! This color looks beautiful on you! And the color combination of the necklace and the top is great! Love your style!